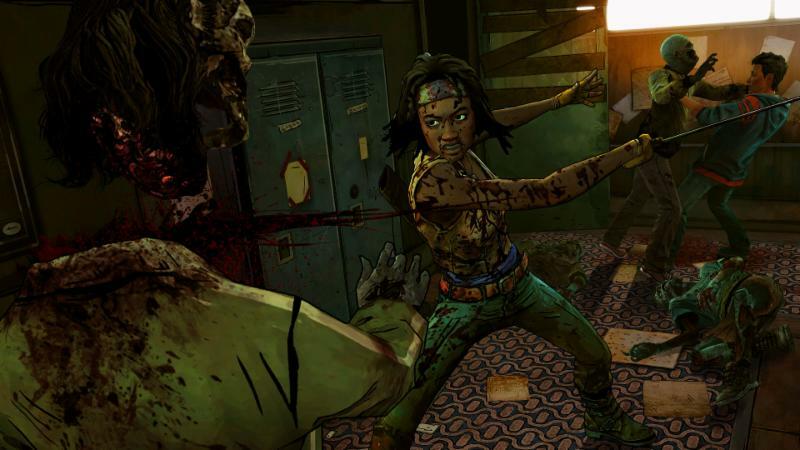 The Walking Dead: Michonne marks a return to one of Telltale Games’ most celebrated series. While the scope of the developer’s adventures has grown significantly since The Walking Dead first shambled to release back in 2012, there’s something about about the timeless struggle between the undead and the darker side of human nature that manifests itself in times of abject desperation that still commands an undeniable hold on our psyches, always pulling us back for more. 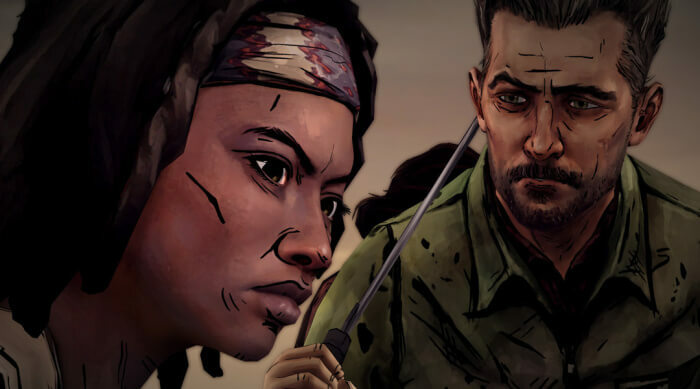 ‘In Too Deep’, the premier chapter in The Walking Dead: Michonne, is a bit of a slow burn, but the developer’s unrivaled knack for storytelling and the game’s titular character’s mysterious backstory make this debut worth experiencing. In Too Deep begins in a trippy montage of blood and nightmare visions as a clearly disturbed Michonne teeters on the brink of insanity. It’s in this haze of tormented delirium that we’re introduced to a genuinely flawed and fascinating protagonist, whose inner turmoil is buried beneath a mask of stoic determination throughout much of the chapter. Haunted by her past, Michonne seems to exist between two realities: a former life she’s struggling to come to terms with, and the rotting hell that’s unfolding around her as things go from bad to worse over the course of the roughly 90-minute episode. A more than capable killer, Michonne casually cleaves limbs and heads off her rotting assailants with measured machete blows while barely batting an eyebrow, making it seem like the threats around her are secondary distractions, while her focus remains unwavering on some greater task at hand. It’s this potent mix of cool efficiency and driving mania that makes Michonne such a fascinating character, even when she’s not even expressing her thoughts through words. 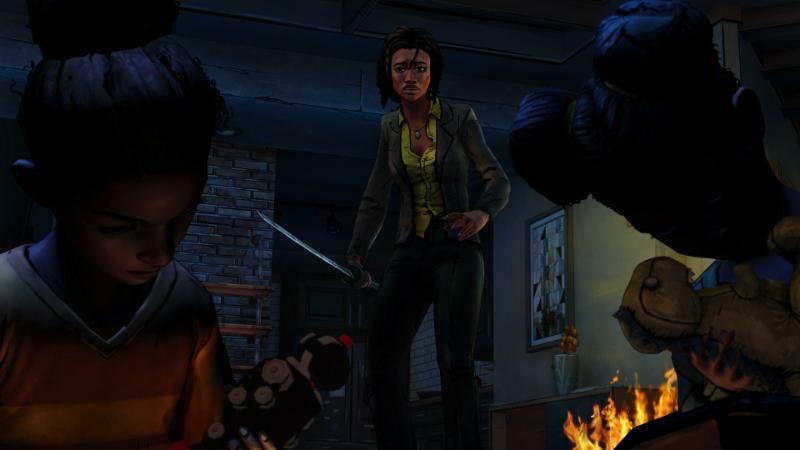 Despite Michonne’s complexity as a character, the rest of In Too Deep doesn’t stray far from what you’d expect from a Telltale Walking Dead release, sometimes feeling like a bit of a step back in scope due to the episode’s extremely linear nature that leaves little room for exploration as events rapidly unfold. Only a small handful of locations are used in this chapter, and you’ll seemingly spend just as much time engaging in QTE’s as you do exchanging dialog with the small cast of characters Michonne encounters. It makes sense, especially given Michonne’s reputation for her considerable combat prowess – after all, this is a woman who’s been known to walk ghouls on leashes like putrid puppies – and the choreography of these cinematic bloodbaths is as over-the-top as you’d come to expect from the studio. Even still, I can’t help but wish the chapter’s dialog choices felt a bit more meaningful, as they never really seem to make a huge difference on how the conversation unfolds (with the exception of a rather unnerving sequence later in the episode). Apart from that, you’re generally just given the choice to play the good guy, or make outward attempts to piss off everyone else around you – a choice that they’ll remember, in the typical Telltale fashion. As for the cast of characters, they’re largely overshadowed by Michonne herself. There’s Pete, the resident all-around hero looking to change the world by helping everyone he can as he cruises up and down the zombie-ravaged coast in his sailboat. He’s generally likable, and his jovial nature and kindness serves as a solid contrast to Michonne’s fierce intensity. The rest of the crew of his ship feels largely secondary though, and they’re forgotten just as quickly as they’re introduced. Additionally, Randall and Norma, the main antagonists of In Too Deep, fail to come across as interesting heels with their cliche, ham-fisted portrayals as murderous sadists. While it’ll certainly feel good to see them ultimately get their comeuppance, their two-dimensional delivery fails to make them compelling villains. Then again, given The Walking Dead: Michonne’s compact, 3-episode duration, it’s understandable that there’s little room for nuance. Even still, I can’t help but hope that the following two chapters are a bit better flesh out, because as strong as a character as Michonne is, I fear she may not be able to carry the entire miniseries on her own. In terms of presentation, The Walking Dead: Michonne looks great, even when considering the aging framework it’s built upon. The dark and dreary waters the story unfolds upon feature plenty of unsettling atmosphere, and the animations are a step up from previous Telltale entries, especially during some of the episode’s flashier combat sequences, which feature elaborate executions and plenty of flashy choreography. The lip-syncing and facial animations look great too, and do a fantastic job of showcasing each character’s state of mind, from the sadistic mania of the crazed Randall and the smug swagger of the queen bandit Nora to the hollow look of desperation that consumes Michonne’s eyes, all of these work to bring the game’s cast of survivors and scavengers to life. Best of all, the action remained fast and fluid, with not one trace of the a trace of slowdown or audio issues that commonly dog games built on the Telltale Tool Engine to be found. 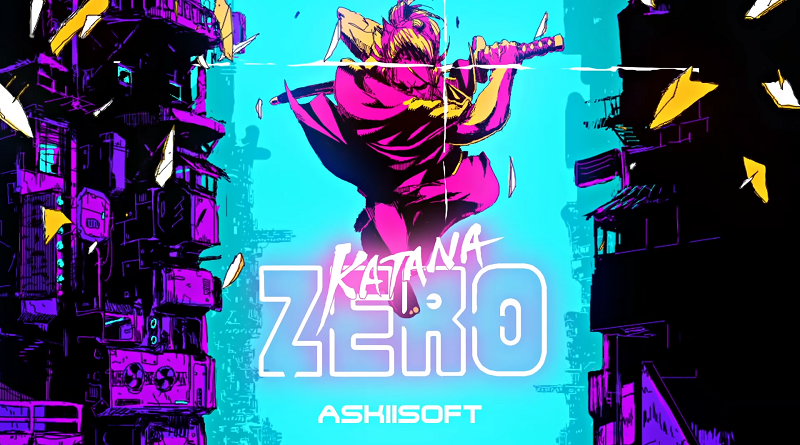 This same attention to detail has been paid to the game’s soundtrack, which once again fits the storytelling perfectly with poignant opening and closing themes that fit the action like a well-worn glove. The voice acting is solid as well, with Michonne’s dialog fittingly subdued to reflect her detached nature, and the rest of the main cast of characters delivering their lines convincingly. Randall’s psychotic, good ‘ol boy tangents are absolutely intense, and Norma’s manipulative taunts are sure to make your skin crawl. And Pete does a great job of sounding reassuring even in the worst of situations, despite his very limited screen time. All told, despite the episode’s limited scope and underwhelming antagonists, Michonne herself was such a fascinating character that I couldn’t wait to see what she did next. The story itself feels largely overshadowed by the game’s titular character, which in some ways holds the rest of the episode back from being as fleshed out as it could be. As a protagonist, Michonne is certainly fascinating. However, Telltale will have to work to deliver an equally compelling world and supporting characters over the next two chapters to make this miniseries live up to its full potential. Full disclosure: This review was written based on review code supplied by the game’s publisher, Telltale Games.